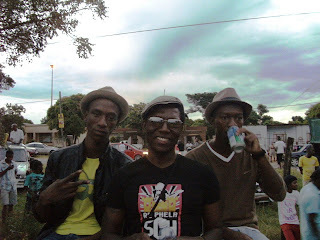 Mpumalanga’s flagship hip hop pilgrimage, Luv Ur Hood (themed Marope Ra Maja) kicked off 2011 with a bang. Within a short space of four months the session hosted two shows that exposed new emcees, new voices and new patrons to this grassroots hip hop extravaganza pioneered by Katsuko and Masta H.
The 2011 revolution, started off on 26 March with an outing to Love Life Centre at Acornhoek. Luv Ur Hood has never been held outside of its home Ga-Kabila, which is a chillaz doubling as a car-wash.
Mesmerizing was the performance of KFB and newcomer to the game Young KC. Modelling his style and swag after the Young Money crew, KC had half the crowd eating out of his palm as he was accompanied by his cousin and hypeman for the day Masta H. At least a hundred patrons were entertained. With regulars DJ Sparkle, newcomers JOP, Wonder, Chris Force Feed and two DJs from Radio Bushbuckridge KP and Matt the show gave a platform to b-boys Wild Cats. There were also life skills offered by the Love Life team. On 24 April, barely a month later the duo took the session, themed Mangozi ya tala ka Spice, back to its spiritual home, Ga-Kabila in Shatale. Characterised by a proliferation of tight emcees and ghetto merchandise on sale and display, the Freedom Day eve show was off the hook. Krazy Doggz brought their whole entourage to the show which was graced by hundreds of good-looking patrons. Blue Noise from Sabie performed and bootlegged their CD titled Focused. Young KC held down the stage but the show was flipped by Dwarsloop’s manic Dialectic. This brother to Sparkle free-styled with so much flow that even KFB who free-styles had to pick up his game. On the day Katsuko performed what is undoubtedly going to become the Luv Ur Hood anthem titled Ke Tšwa Bush. On a show that was more about flexing muscles and impressing hordes of senhoritas, C-well blasted, KP and Masta H spit rhymes in Get Your Swag On, a song from H’s still-in-the-kitchen mixtape. On sale were mixtapes from Krazy Doggz and Blue Noise. Also sold were tons of t-shirts by 100% Lepulana/Tsonga, Re Phela SOH, Luv Ur Hood, Shatale Ya Rocka etc. Langa Media’s Nellie Ndlovu (publisher of Bushbuckridge News) graced the event and showed interest in a partnership. The next Luv Ur Hood show will be hosted by Krazy Doggz in Thulamahashe in June.